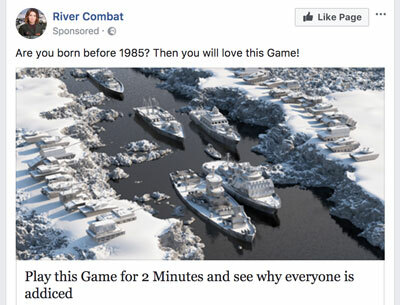 This week’s lesson on crafting a good Facebook ad is to make sure that your image matches your sales copy. 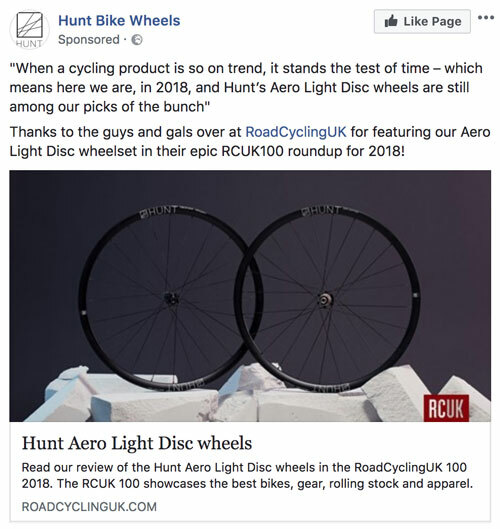 Take a look at this advert from Hunt Bike Wheels. This ad is just confusing because it’s talking about disc wheels, but the wheels in the photo are clearly not disc wheels. 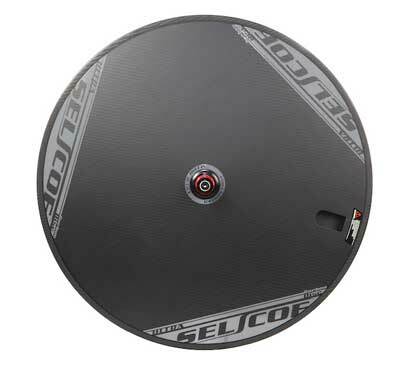 You’ll notice that this one looks like a disc. Now, you could argue that I have misunderstood, and they’re actually talking about wheels with brake discs on them. 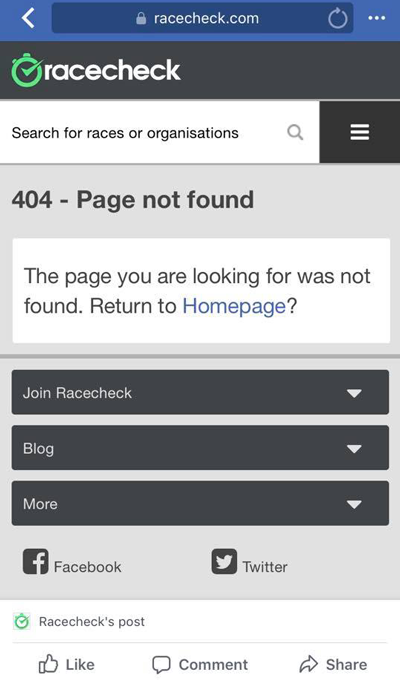 Which, from the look of their website, which features a lot of wheels with brake discs on them, is probably the case. But there aren’t even any brake discs on the image in the advert. All of this causes a lot of confusion for the user who struggles to work out what they are looking at. To avoid this, make sure your image makes sense with your sales copy. 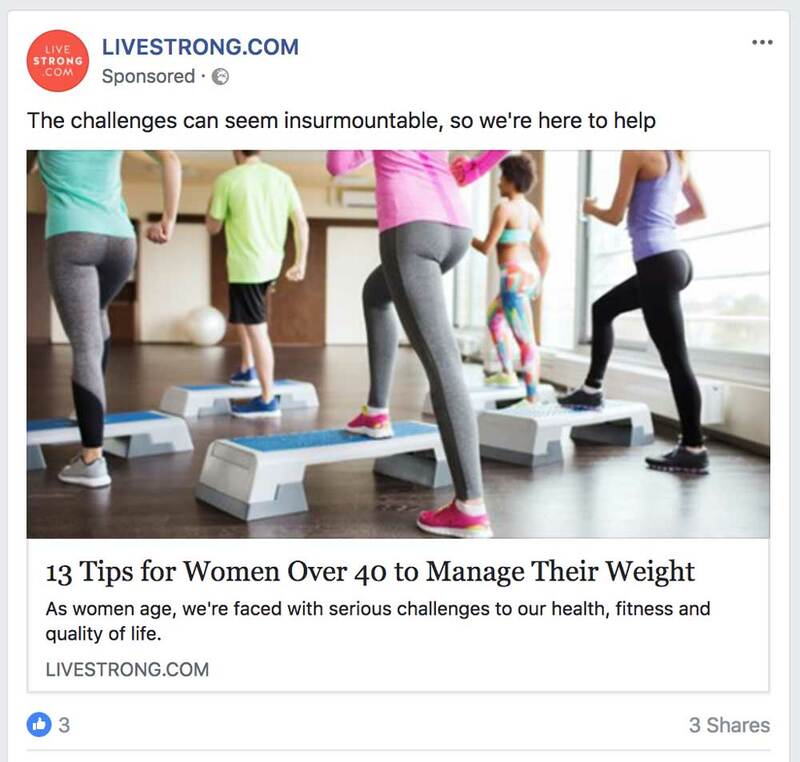 Live Strong is back with a new ad this week. They’re not suggesting I’m over 40 this week, but it still seems a strange use of your advertising budget to show me this. Last month, I wrote about people wasting money on advertising. I said it happens a lot: and it does. Here are two more examples I found this month. 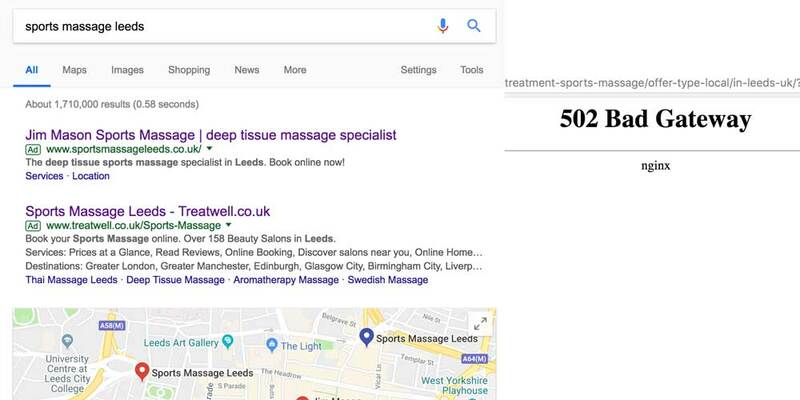 First, here is a Google AdWords advert by Treatwell. 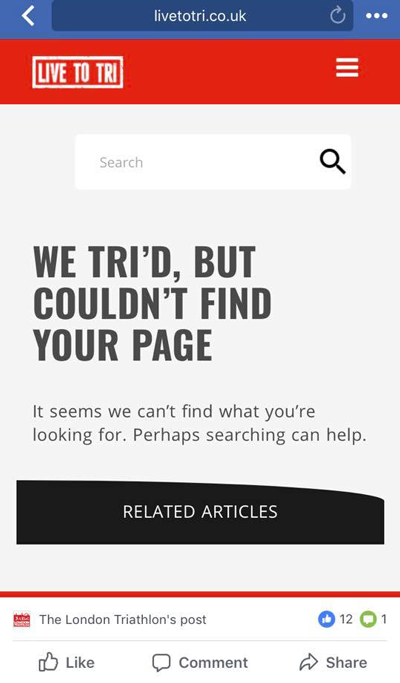 Except the page does not work. 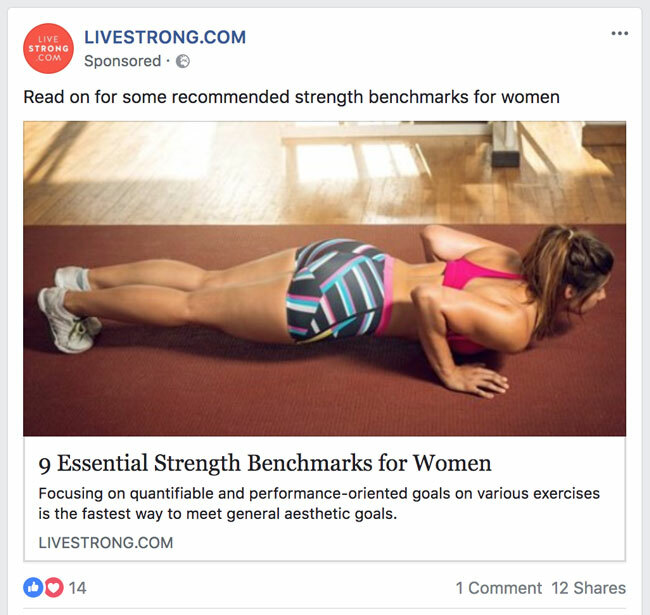 And here is an advert from Live Strong. The link does work: it takes you to the article on tips for women over a 40. 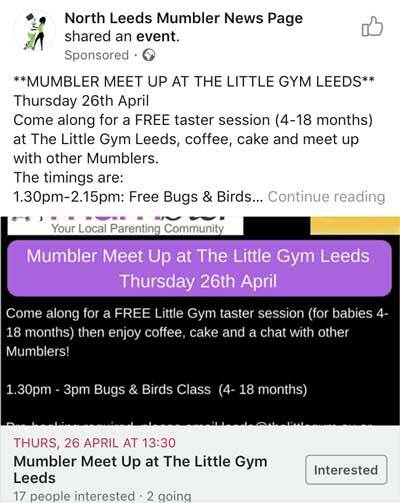 Bear in mind that you put the targeting parameters in when you create a Facebook ad. 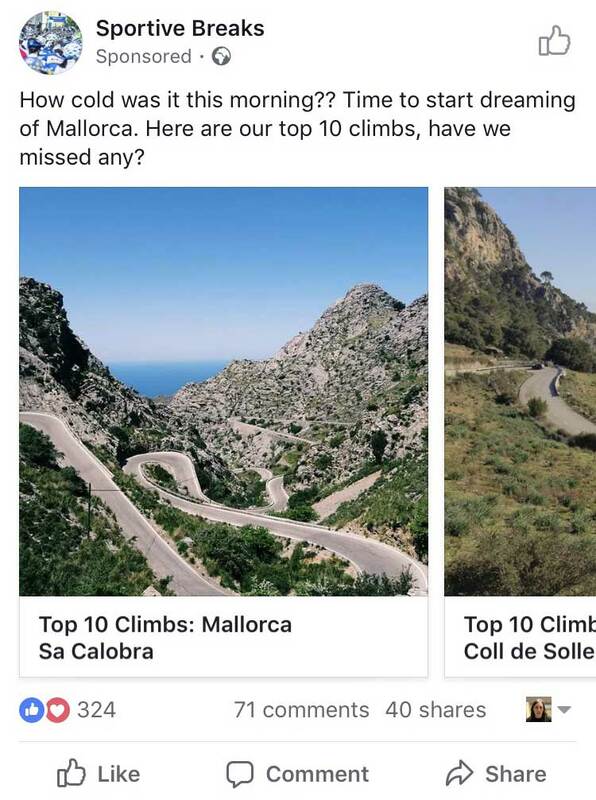 Facebook knows I a man under 40, so they could easily exclude me from seeing an ad I obviously have no interest it. How reliable is MailChimp tracking? When you send an email newsletter with a provider such as MailChimp, Aweber, etc, they give you a report on who opens your emails. But how accurate are these numbers? I had the opportunity to test this recently. It’s good practice to clear your email list periodically because email providers use open rates to access whether your email is spam or not. So, if you have a lot of old, inactive addresses on your list, or it’s going into people’s spam box and they’re not seeing it, it is a good idea to remove them so that it does not affect email delivery to the people who are reading your emails. For two lists I had, I created a segment who had not opened the last five emails we sent them. I then sent these people an email saying “are you receiving this?”, inviting people who still wanted to receive the email me back. Anyone who did this would indicate that the numbers are not accurate. We had 120 people on the list. 36 had not interacted with the last five campaigns. 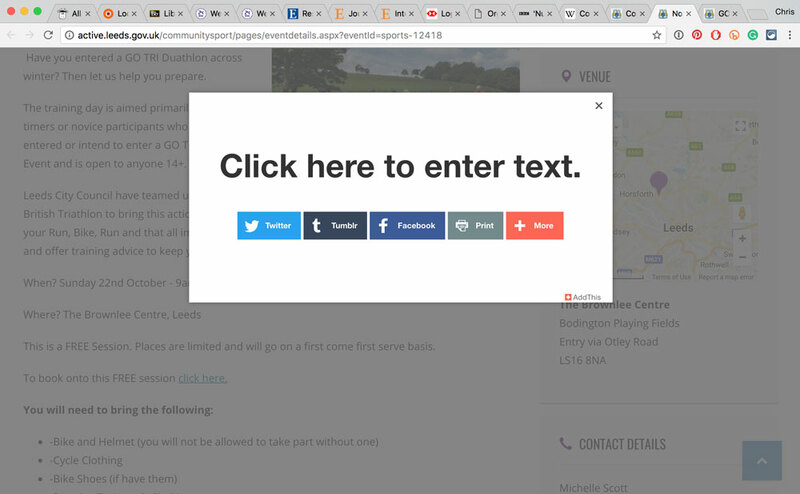 Of those, 11% read and 6% clicked the email. This suggests that people are receiving my regular emails but choosing not to read them. An additional four people emailed me to say they wanted to continue to receive the email. This suggests that the tracking statistics are out by a significant amount. This is because this is just the people who were bothered to email me back; how many were in the same situation but didn’t bother to? We had 256 people on the list. 100 had not interacted with the last five campaigns. 7 people emailed me to say they would like to continue receiving the emails. Again, this is probably only a selection of the people who are receiving the emails and not being tracked. The open rate tracking provided by MailChimp, and likely other email providers, is a useful guide to see campaign to campaign. However, it does not seem to be an accurate measure of who exactly is reading your email because many people are reading them but not reporting as having done so in the reports. There are a lot of excellent podcasts out there. I could do a whole blog post on my favourites. But, in particular, there are a few episodes that really stand out as useful for entrepreneurs and marketers. I’m only listing a few here, with a plan to expand this list over time. Noah Kagan is the founder of Sumo.com. 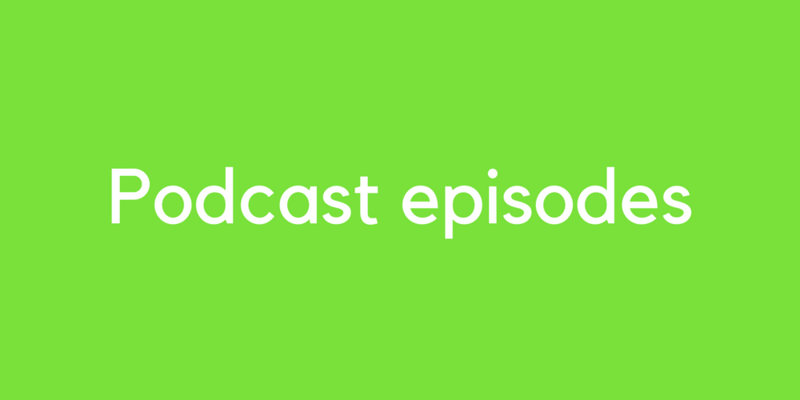 In this episode, he interviews Tim Schmoyer, an expert on YouTube marketing. David Garfinkel is the star of the show in the Copywriters Podcast. Getting inside your prospect’s head is difficult and few people explain it well. I think Garfinkel has come the closest. Mike Dillard runs Self Made Man. In this episode, he interviews Russell Brunson, founder of Clickfunnels, and author of Dot Com Secrets. Why would you advertise for people people? This is the second of two blog posts about billboards. Life does not get any more exciting than this. Read part one here. I ran up the canal. And for a long time, there was a First Direct billboard half way up my route that said: “people people wanted”. Every week I told myself I should take a photo of it. Finally, after a month, I resolved that this would be the day. So, I ran up there, pulled out my camera and… it had gone. 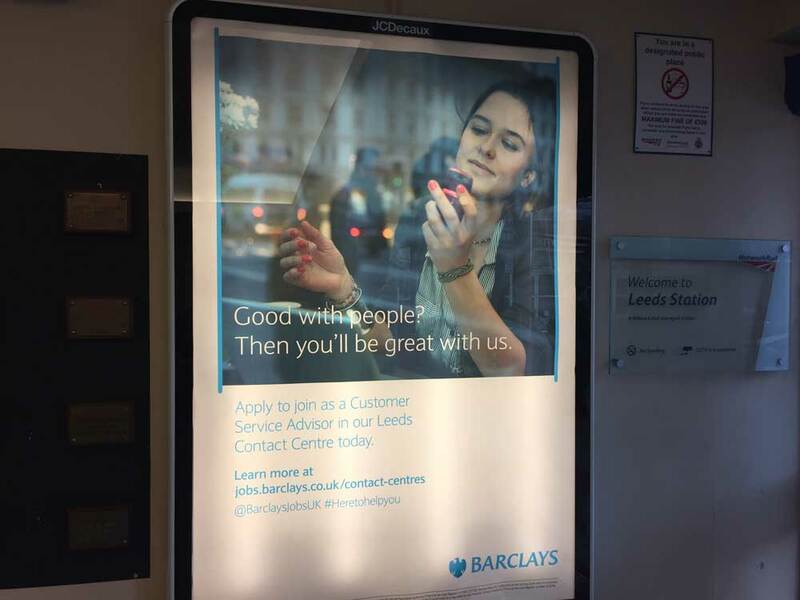 However, I recently saw this advert at the train station and it will illustrate my point just as well. Good with people? Then you’ll be great with us. In both of these instances, it could be that they are just looking to drive some recruitment there way. And to an extent, it is. But there must be far more cost-effective ways of finding people than a billboard that targets everybody. Most people have a job, for example, and don’t work in customer services. However, these advertisements serve a secondary purpose. Few people are people people looking to move into a different customer services role. But everybody would like a bank with friendlier customer services.